A simple recipe for pumpkin puree. You can make it either classic in the oven, or super quick in the microwave, or cooking in the pot. 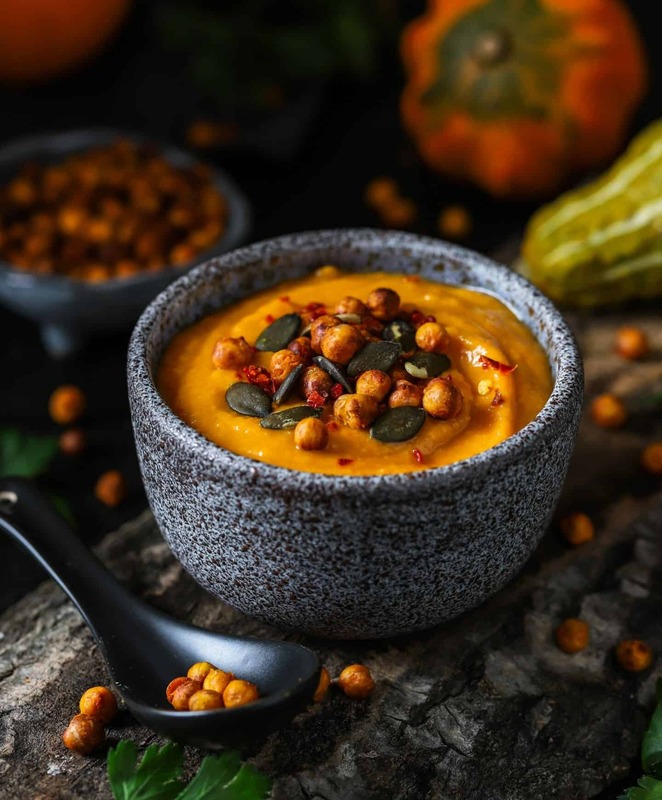 The pumpkin puree is great for preparing a variety of dishes, such as a creamy pumpkin soup, pumpkin pasta, or vegan Pumpkin Mac and Cheese. Pumpkin Puree - 3 easy ways wo make it! A simple recipe for pumpkin puree. You can make it either classic in the oven, or super quick in the microwave, or cooking in the pot. The pumpkin puree can be stored in a refrigerator for about 5 days or frozen in stock. Clean the pumpkin and cut off the ends. Then halve, remove the seeds with a spoon and cut into pieces. Place the pieces in a baking dish with a lid and let it cook for about 2-3 minutes in the microwave. Then, blend soft pumpkin pulp in a blender. Optional, add seasonings and a bit of water, until desired consistency. Preheat your oven to 390°F upper/lower heat (or 355°F circulating heat). Clean pumpkin, cut off the ends, cut in quarters and core. Place the pumpkin quarters on a baking sheet lined with parchment paper. Brush with a little olive oil and bake for about 40-50 minutes (depends on the size), until the pumpkin pulp is soft. Core pumpkin and cut into pieces. Place pumpkin pieces in a pot and cover with boiling water. Cook for about 10-20 minutes (depends on the size), until soft. Discard the boiling water and blend soft pumpkin pulp in a blender. Optional, add seasonings and a little bit of the cooking water, until desired consistency. If you use Hokkaido Pumpkin, you don't have to peel it because the peel gets soft after cooking/ baking. If you use butternut squash or any other kind of pumpkin instead, you should peel it. You can easily remove the peel after cooking/ baking.